Tools for product identification must become increasingly robust to accommodate wider and more complicated supply and distribution channels. Food recall systems need to be adaptable to expanding distribution networks. Enhancing visibility at each point in the supply chain and expediting the food recall process are at the heart of food traceability and tracking strategies. The Global Food Safety Initiative (GFSI) was launched in May 2000, in response to a string of damaging food safety incidents, growing consumer uncertainty, and the need for global collaboration on food safety standards. GFSI is coordinated by the Consumer Goods Forum, which includes 200 retailers, 200 manufacturing companies and 150 countries, and seeks to enhance efficiency in the food supply chain by minimizing disparities and emphasizing collaboration between various international food safety systems. This is reflected in GFSI’s tagline: Once Certified, Accepted Everywhere. In terms of traceability, all GFSI recognized schemes outline a minimal level of upstream and downstream traceability for food. Food safety relies heavily upon visibility throughout the supply chain – from suppliers to primary production, processing, manufacturing, transportation and distribution to retail or food service. Increasing product visibility in the food supply chain means having more detailed and accurate product information, and improves the movement of goods in real-time. This allows businesses to be more responsive to change and improve business operations, such as inventory management and replenishment. GS1: Founded in 1977, GS1 is an international not-for-profit association that develops and implements global standards to improve product visibility in the supply chain. The GS1 System is the most widely-used supply chain standards system in the world. GS1 provides e-commerce, traceability and bar code standards, enabling its members to efficiently manage operations both upstream and downstream. Certified bar codes bring benefits not only in enhanced food traceability but also provide industry compliant, globally accepted bar codes required by many major retailers. New challenges to tracking and tracing products in the supply chain have spurred innovations in the field of product identifiers, building on the standard bar code and enhancing the amount of data that can be stored. Resulting improved efficiencies in purchasing, receiving and inventory control bring cost savings and deliver value to customers. Newer versions of product identifiers developed by GS1 can store much more specific information, in addition to significantly accelerating the food recall process with enhanced product visibility. 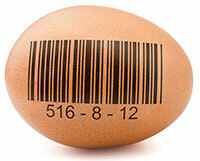 Electronic Product Code (EPC): EPC tags are different from barcodes in how specific they are. They denote individual products with a unique serial number, whereas barcodes only identify groups of products. So rather than have a barcode common to all cans of Coke, every single can of Coke has a unique serial number. Information from EPC tags can be linked to secure databases and accessed remotely from any location where there is an internet connection, giving easy and convenient access to product information. EPC tags were developed by EPCglobal, Inc. – a joint venture between GS1 (formerly known as EAN International) and GS1 US (formerly the Uniform Code Council, Inc.). The EPCglobal Tag Data Standard is an open standard, freely available for download from the EPCglobal Inc. website. Radio Frequency Identification Device (RFID): RFID tags can be scanned with a reader, which can then transmit and report the information to a remote database that is accessible via the internet – a product’s location, condition and status is provided in real-time. RFID tags are being used across many sectors as a highly efficient and accurate way to trace a food product from its origin and throughout the supply chain. The value of the technology is evident, and major retailers are identifying the potential for increased efficiency. For instance in 2005, Wal-Mart required its top 100 suppliers to apply RFID labels to all shipments, and subsequently stated their intention to expand their RFID focus in 2007. Studies have investigated the impact of RFID tags on operational efficiency. In October 2005, the University of Arkansas’ Information Technology Research Institute released a preliminary analysis of the impact of RFID on reducing retail out-of-stocks and concluded that RFID reduced OOS by 21% over non-RFID based stores. Globalized supply chains are changing the way that food recalls are managed and how they play out. The recent passing of the Food Safety Modernization Act in the United States reflects the urgency with which legislators are viewing stratagems to improve the food recall process. A key provision of the FSMA gives the Food and Drug Administration the authority to force a company to recall food products, whereas in the past they relied upon voluntary compliance and were largely handicapped at a time that calls for expediency. Minimizing delays with mandatory food recalls is one of the few provisions of the FSMA that became effective immediately. Food safety recalls can happen in a variety of ways, depending on the severity of the risk and how the problem was discovered. In all cases, affected food must be removed with precision, speed and accuracy to avoid costly litigation risks, regulatory enforcement and potential damage to brand reputations. To help businesses satisfy complex regulatory obligations and assure rapid and seamless communication with distributers, retailers and consumers, data-driven technologies have been developed to expedite the food recall process. GS1 Canada, via a cloud computing platform developed by Hewlett Packard, developed a service called GS1/Zone Product Recall. This industry-driven communication tool allows companies to notify their retail trading partners of food safety issues, securely and in real-time. Harmful products can be accurately identified and removed quickly, before they reach the consumer. Data-driven technologies are central to developing more rapid, timely food recall responses. Food safety is top of mind for consumers, government and industry. The stakes are high for all participants in the supply chain. Countries desiring to gain an advantage in global markets by gaining a reputation for producing and selling safe food are updating their food safety legislation. Companies continually seek to eliminate inefficiencies in supply chain operations, to avoid passing costs onto the retailer and consumer. Major retail stores may have hundreds or even thousands of vendors supplying all sorts of products, and they need assurance that food is safe. It is of paramount importance that consumer trust is strengthened and maintained. All of these factors contribute to the demand for food traceability standards, which are becoming increasingly crucial to preserve the integrity of the global supply chain.